Forty years ago, Sanrio introduced Hello Kitty for the first time on a coin purse in Japan. Now, the two-dimensional cartoon has become one of the most well-known characters in the world. From Hello Kitty weddings to airplanes and tattoos, she has become more than a brand – she's a full-fledged lifestyle and a benchmark of Japanese-American culture. What is it about Hello Kitty that draws so many people to love her? 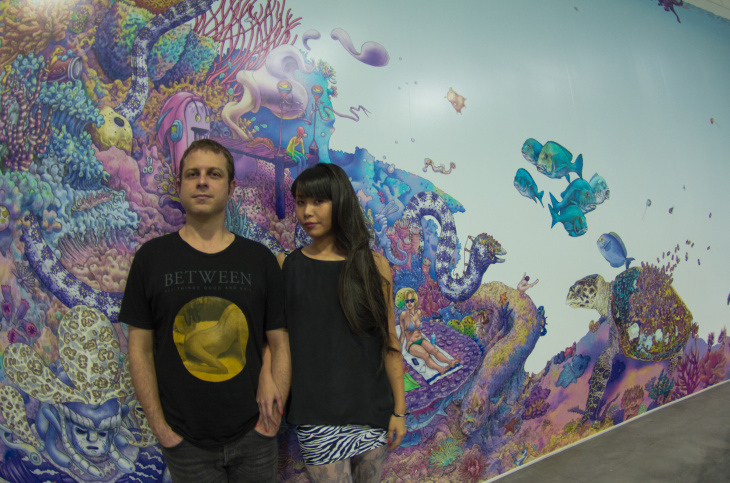 Artists Dan and Kozy Kitchens, who collaborate under the name Kozyndan, stand in front of a mural they designed. "Kitty Visions", by Kozyndan. 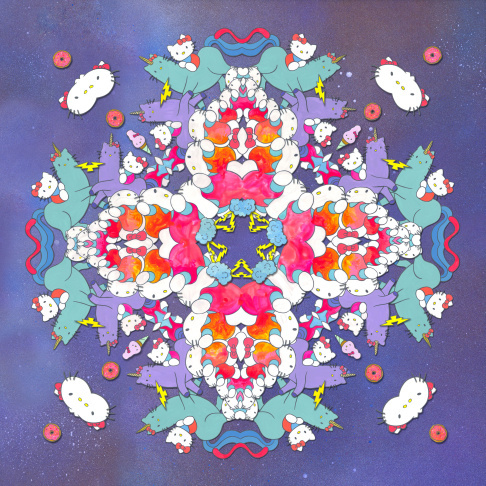 Los Angeles artists Dan and Kozy Kitchen contributed the work to the JANM Hello Kitty exhibit. An earlier made-for-Sanrio work by Kozyndan, featuring Hello Kitty scuba diving. 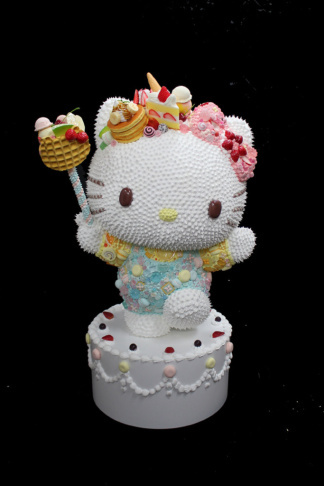 Hello Kitty Con may be over, but anyone interested in celebrating contemporary art and Hello Kitty can head to the Japanese American National Museum in Little Tokyo for "Hello: Exploring the Supercute World of Hello Kitty." 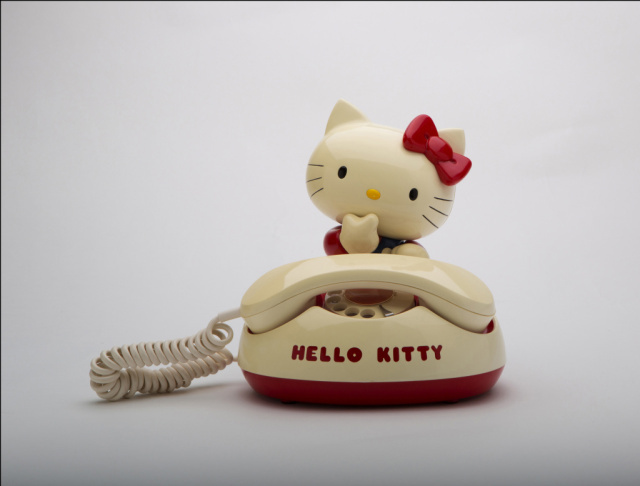 This exhibit mixes artifacts from Sanrio's Hello Kitty archives along with original works by artists from all over the world. 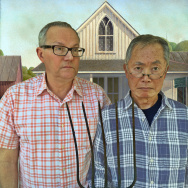 Kozy and Dan Kitchens make up Kozyndan, a husband and wife team whose work is featured in the exhibit. 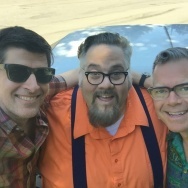 Off-Ramp producer Kevin Ferguson talked with the team at their Highland Park home. "I guess I didn't have many choices between many characters when I was growing up," said Kozy Kitchens. Kozy grew up in Japan, not far from the town where Sanrio started. She said she owned dozens of Hello Kitty items as a child: slippers, backpacks, shoes, socks. Kozy says she grew out of the Hello Kitty lifestyle around sixth grade, but that for many, Hello Kitty still remains very popular. "It's interesting she said that they don't have many choices of which character to choose — as though they had to choose a character. That's kind of the difference between maybe here and there is that it wouldn't even occur to us that we would have to have a character that we have to like and have all these goods based on that character," said Dan Kitchens, her American-born collaborator and husband. "If you go to Japan, it's really prevalent. 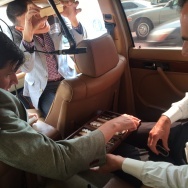 Even business men are buying cigarettes with character toys in them and stuff like that." 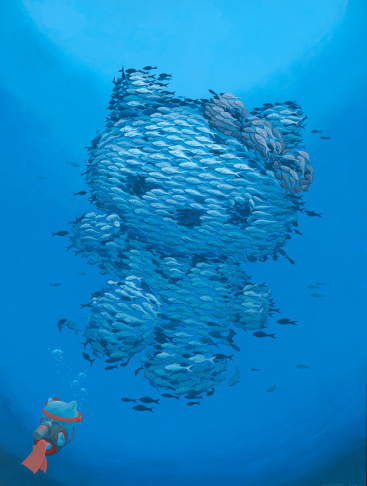 Kozyndan have worked with Sanrio before making different Hello Kitty-influenced designs — one even features Hello Kitty scuba diving. As an art object, Dan said he finds the character relatable through her facial expression. 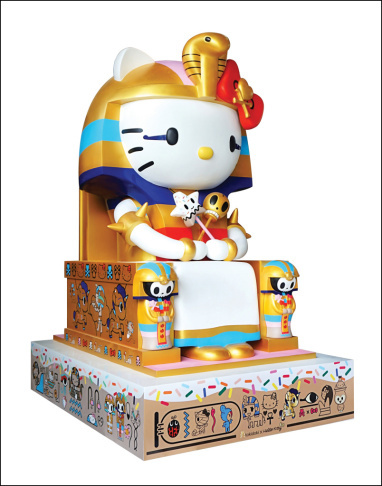 "When we were first approached to do this piece, somebody was telling me a story that they had heard about the creator of Hello Kitty. And I don't even know if it's true — it could be apocryphal. That her daughter was autistic ... and that she wanted to create this character that had a blank expression as a way of relating to her daughter," said Dan. "My sister, who's 14, is autistic as well. So I kind of had a connection based on that." 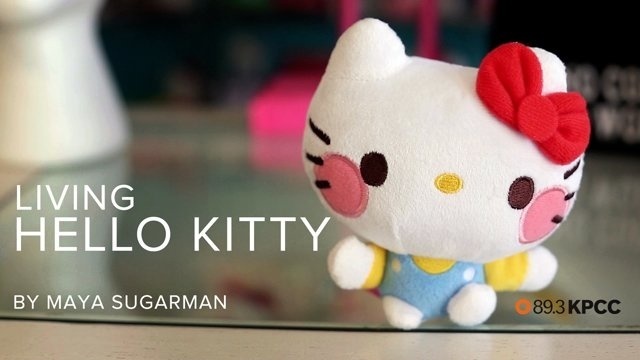 The story is probably a myth — the creator of Hello Kitty, Yuko Shimizu, hasn't brought it up in interviews — but Koji Steven Sakai with the Japanese American National Museum believes Hello Kitty's blank expression is something that millions of people relate to. "Not having a mouth means that she can be with you," he told KPCC's Maya Sugarman. "So if you're sad, she can be sad with you. If you're happy, she can be happy with you, because she has no mouth." Mayor Eric Garcetti wants diagonal crosswalks—but do you?